Flagg Hill was a small ski area that operated in Boxboro. It had just one short rope tow, a double chair (which now operates at Otis Ridge, according to John Schoenrock), and one large slope. I found it a few years ago, but its on a private road, so there is not too much to see. Here's the Terraserver photo, found by Betsy McDonough. 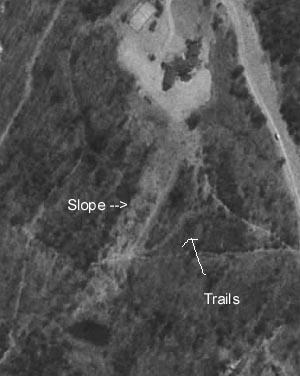 Notice the wide slope where the rope tow operated, and a few narrower trails. The vertical drop was near 150 feet. Also, the pic shows that the area was upside town, with a lodge on top. The Southern New England Atlas, provided to NELSAP by Tom Moore, shows Flagg Hill on the map. The area closed sometime in the 1970's. Boxboro Hills opened sometime therafter, giving residents another choice to ski in the town. Flagg hill started with a rope tow, but somewhere in the mid to late 70's they put in a chairlift (if I'm thinking of the right place. We'd drive by it a couple times each week on the way to hockey at the Acton Boxborough rinks). They began marketing it as a country club with tennis, skiing and who knows what else.